If you want to add Android Lollipop like on-screen navigation controls on your iPhone, there’s a pretty easy way to do just that. More details can be found after the jump. AlternateControls from Cydia is your best and easiest bet for adding a navigation bar to your iPhone, with the tweak looking like it has been directly ported from the Android OS itself. 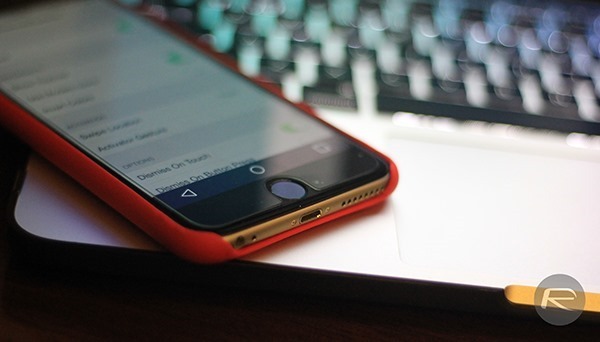 AlternateControls’ entire purpose is to provide an extra set of on-screen buttons docked at the bottom of the display to easily and quickly navigate the iOS 8 scape of your device. The tweak is no pushover though, and has plenty of customizations and features to help you make the most out of it. I know I will get a lot of heat from iOS fans for even suggesting the idea, but those who have extensively used both the platforms would know how convenient these navigation buttons are, especially when calling up a context menu, or simply going back, despite the navigation bar taking up a few rows of pixels on screen. In context of this particular tweak, users can customize the style of the navigation bar with the option of the latest Android Lollipop look, or the more contemporary KitKat or Jelly Bean styled controls, complete with the color choice of a white or black. Worried about the controls layering up over display? 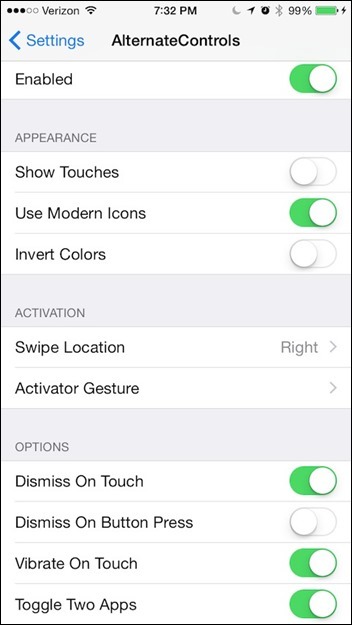 Simply set the swipe activation gesture in the tweak’s settings to call up the controls or dismiss them. 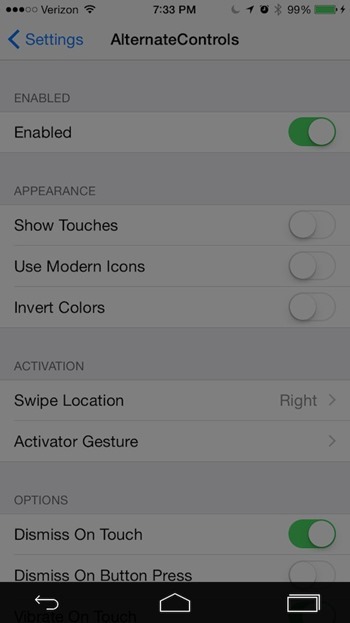 According to the developers, the tweak is accessible through any gesture assigned via the much popular Activator tweak from Cydia. 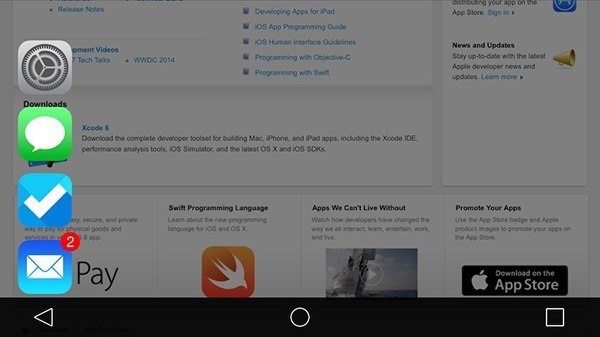 As for the controls, you have the option to go back through all the apps you have visited, quickly toggle between two apps, and access a list of previously visited apps by pressing and holding down on the Back button. 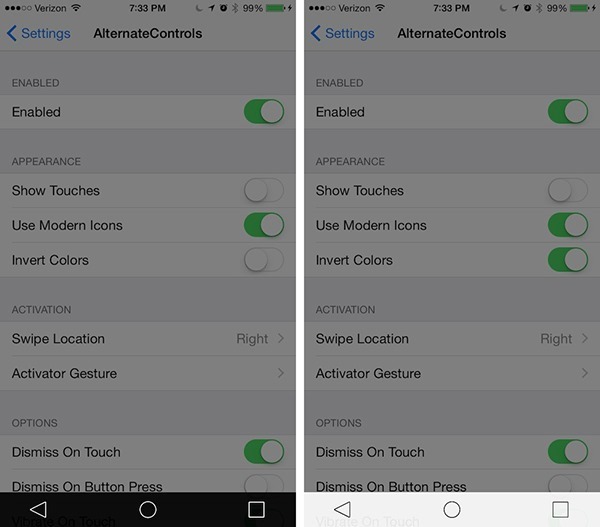 AlternateControls is compatible with iOS 8 and is available from the BigBoss repo in Cydia, costing a mere $0.99. Lastly, if you want to complete the ‘Lollipop’ effect on your iPhone, then also give CheeseCake a shot, which will bring Google’s latest mobile OS’s screen fadeout animation to iOS.